The CAM can be used on IRDs, which has DVB-CI interface. Meticulously tested with IRDs models from Europe, the middle East, Australia, Asia. The CAM supports Viaccess ACS 3.0 enhanced secure features (optional). 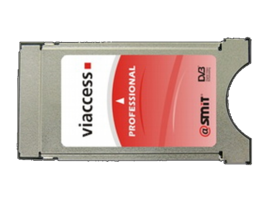 With an authorized Viaccess smart card, the CAM gives access to DVB encrypted program. SMiT Viaccess PRO 2 CAM is able to descramble up to 2 services simultaneously.